Rodin’s The Gates of Hell is one of the crowning jewels of Stanford’s sculpture collection. A monumental work of this scale requires a significant conservation effort. As with all sculptures in the outdoor sculpture collection, The Gates is cared for by the conservation crew, and its condition is constantly monitored. All bronze sculptures receive an annual treatment of washing, waxing, buffing, and any other additional conservation treatment necessary, including touch-ups. This conservation work preserves the sculpture in perpetuity and heightens visitors’ experiences of it. 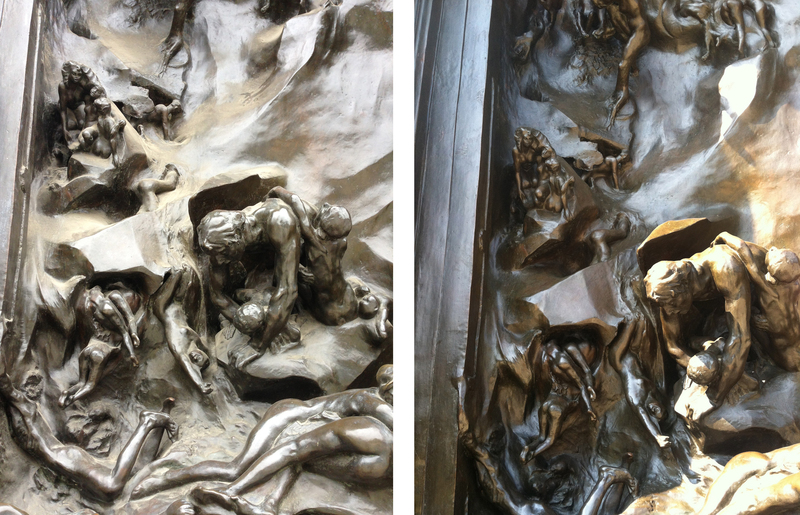 Preventative conservation treatment of The Gates of Hell is a weeklong project. The work began early on a Monday morning with a thorough washing of The Gates. The conservation crew faced many challenges: first, how to reach and wash the upper reaches of a massive sculpture nearly 20 feet tall. 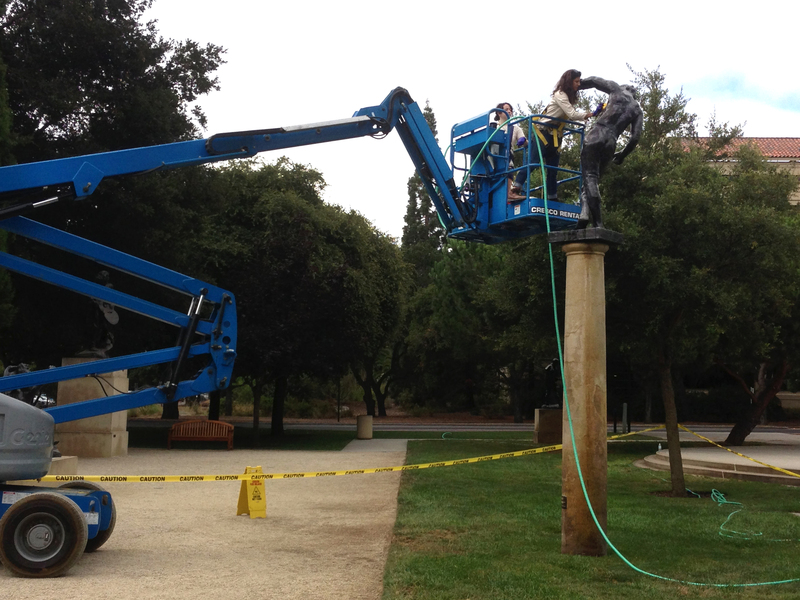 A 45-foot electric boom lift with an articulated arm was the answer, but this posed its own challenges, including how to maneuver the lift into a garden full of other priceless Rodin works, and how to position it in relation to the large, broad, raised pedestal that The Gates sits upon so that the arm of the lift could extend to reach the entirety of the sculpture. In areas where the lift arm could not reach, a large ladder was used. Once these logistics were smoothed out, the cleaning could begin. An entire day was dedicated to washing The Gates. Every crevice of the sculpture had to be rinsed, washed with soft nylon brushes and a gentle detergent known as Orvus, rinsed again, and then dried. All of these steps are crucial. The first rinse helps to remove large debris or dirt accumulations on the sculpture. Interesting things were found at this stage, including several small rocks high up in the top pockets of the sculpture and a headband that must have been slung onto the roof of the piece. Soap and soft scrub brushes do what one would expect, assisting in the removal of the tougher grime, including things like bird droppings. Another unexpected discovery during the treatment was four individual wasp nests, nestled in among the twisting figures in low relief areas. Professional exterminators were called in to remove the nests so that conservation could proceed. After the final rinse, the sculpture was dried with soft towels to prevent minerals in the water from depositing on the surface through evaporation. 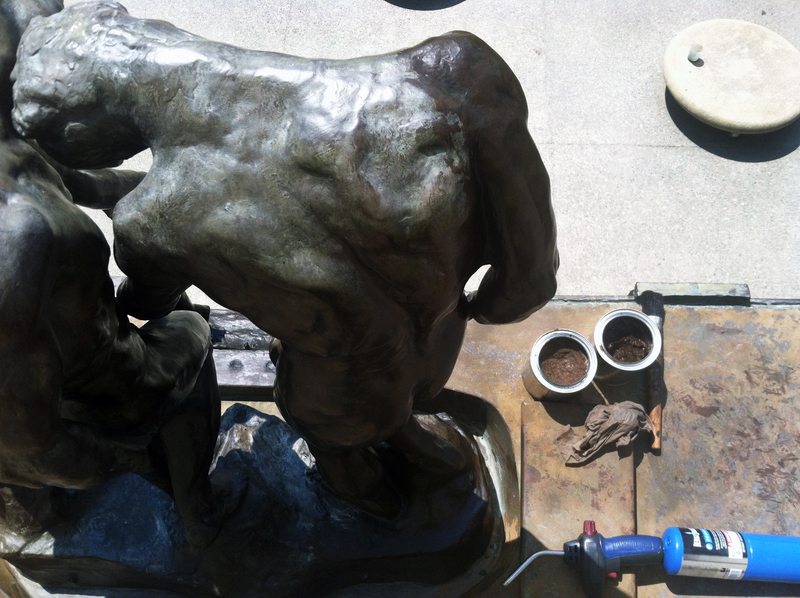 These mineral deposits detract from the sculpture’s patina and are difficult to remove. Waxing: Stanford student Bryce Cronkite-Ratcliff heats the metal surface before applying micro-crystalline wax (left), a detail of before and after waxing (center), and the Conservation Crew at work buffing the new wax coating (right). Crew from left to right Jocelyn Chan (small ladder), Bryce Cronkite-Ratcliff (top of large ladder), Lauren Sweet (lower larger ladder), and Elizabeth Saetta (boom lift). The next steps were wax application and buffing. The wax application is ideally done when the metal is warm, so that the wax melts and then coats the metal surface thoroughly and evenly. To get the most complete and successful application, propane torches were used in conjunction with the heat of the afternoon sun. The conservator’s tool kit included: a tinted micro-crystalline wax thinned with mineral spirits, brushes, propane torches, and nylon stockings. Once the wax was applied, the spirits evaporated, leaving only the protective, hard, solid wax layer behind. At this point the surface was thoroughly buffed, a job for which the soft, fine nylon of women’s tights is perfect. Buffing smoothes brush strokes and irregularities in the wax application, and the resulting shine reveals the detailed dimension and relief of the sculpture. At the top: Detail of the “The Three Shades” shoulder during treatment showing only the proper left shoulder coated, with wax and propane torch. Before (left) and after (right) treatment details. By the end of a long week, the conservation crew had washed and waxed not only The Gates of Hell, but also the statues of Adam and Eve that flank The Gates, and The Spirit of Eternal Repose that sits high atop a column nearby. The result is a cleaned, beautifully shining bronze—shielded from the elements with a protective coating so that these masterpieces may be enjoyed by generations of visitors. Cleaning “The Spirit of Eternal Repose” by Rodin.